Kelle Groom—my friend and mentor—sees her best-selling memoir come out in paperback today. It’s a luminous book in which Kelle performs the delicate dance of being both lyrical and gritty without a misstep. The central event in the book is her unflinching account of giving birth to her son when she was 20, unmarried, unmoored and heavily drinking. Her aunt and uncle, childless and still young enough to raise a child, adopted her son when he was four days old. My friend held him twice and never saw him again. She still hears his cries as he was bundled up and taken away. 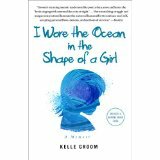 Kelle is a prize-winning poet and the title of her book—I Wore the Ocean in the Shape of a Girl—is both hopeful and elegiac in its reference to the blue dress she wore as a flower girl. She was six when she walked down the aisle strewing rose petals. I was six too when I was the flower girl at my uncle’s wedding. I was all tulle and scratchy netting in a dress that turned me into a preternaturally aqua-colored cupcake. Anna was a flower girl when she was five. She wore a long rose dress with patent leather Mary Janes and fancy white socks that peeked out from the hem as she methodically scattered petals before my sister the bride. Kelle knows the tender soul of a flower girl. After reading Kelle’s book and tiptoeing my way through the rush of my own memories, I believe that Kelle wrote her way to something that Abraham Joshua Heschel called “radical amazement”—a holy appreciation for a moment in time. In my case, it was a holy appreciation for motherhood. When Anna got some good news recently, she was so happy she jumped on my back without thinking. We were both surprised when I gave her a piggyback ride. It had been a half dozen or so years since I last tromped around the house with her on my back. I’m not nostalgic for diapers or mashed bananas. But I miss lifting my children and feeling their beating hearts against mine. I miss their shoes that once fit in the palm of my hand. I’ve stashed away one of Anna’s onesies—the one a friend made exuberantly announcing Anna’s name, date of birth and weight in red and purple waterproof marker. I met Kelle six years ago in a writing workshop in Provincetown. She presented a chapter from her memoir in which she was casting about for a definitive way to link the Superfund site in the Massachusetts mill town where her only child Tommy lived with the leukemia he developed at 9 months of age. He died in 1982 when Kelle and I were 21. I had just graduated from college and was paralyzed with anxiety about what would happen to me without the familiar scaffolding of a school routine. I couldn’t imagine being anyone’s mother let alone experiencing the aching, exquisite love I’d come to have for my children still to be born more than a decade later. A few years ago I found my college journals in the shaggy, pink bedroom of my girlhood. I cringe when I remember that I hoped someone would discover remarkable poignancy in my self-conscious and self-important teenage angst. I wonder if Anna keeps a journal. I wonder when I stopped knowing everything about her. When she wasn’t serving drinks at a bar or dusting the shelves at a health food store, Kelle often drank herself into a black oblivion in the early ’80s. Yet she never stopped writing poetry. I moved to New York and wrote bad fiction. When Kelle and I went out to dinner last year to celebrate the initial sale of her memoir, she had not had a drink in 26 years. At the time, I wish I had known that we had met within days of the 28th anniversary of her son’s death. I’d like to think that when we talked about Tommy that night it felt as deep as a yahrtzheit—the anniversary of loved one’s death—for Kelle. At the end of the book, Kelle sees her son in 8mm films that she has made into DVDs. She writes that she was afraid that these reels of film from her aunt and uncle would crumble before they were digitized. She was afraid she would crumble if she got to view them. But they survived to and went digital. And Kelle watched her son celebrate his first and last birthday from beginning to end in a hospital room. He will be dead in two months. Kelle has shown me that the peace of motherhood is a restless one. She wears the ocean in the shape of motherhood. Every woman does. I’ve come to a teary acceptance of tears and joy in my own mothering. Anna is a young woman but I’m still thrilled—radically amazed, really—when she puts her head on my shoulder and calls me Mommy.